As quite a few people know I am changing the format of my workshops in 2018 so if anyone wants to take part in the present format, please choose one of my Street Photography Workshops from the list below. This is the format for 2017. The workshops will encourage debate about Street Photography and help the participants to be more critical about their work. The workshops are suitable for professional and amateur photographers of all levels. We ask you to familiarise yourself with using your camera and learn how to change settings quickly before attending the day, this will enable you to enjoy the experience fully. The day will start at 10.30am and conclude at 16.30pm with a break for lunch and plenty of comfort breaks throughout the day, most of the day will be out on the streets. There is a lot of walking during the day and the event may take place in inclement weather so come prepared. You will spend the day with myself exploring the streets picking up tricks and tips on my style of Street Photography throughout the day. 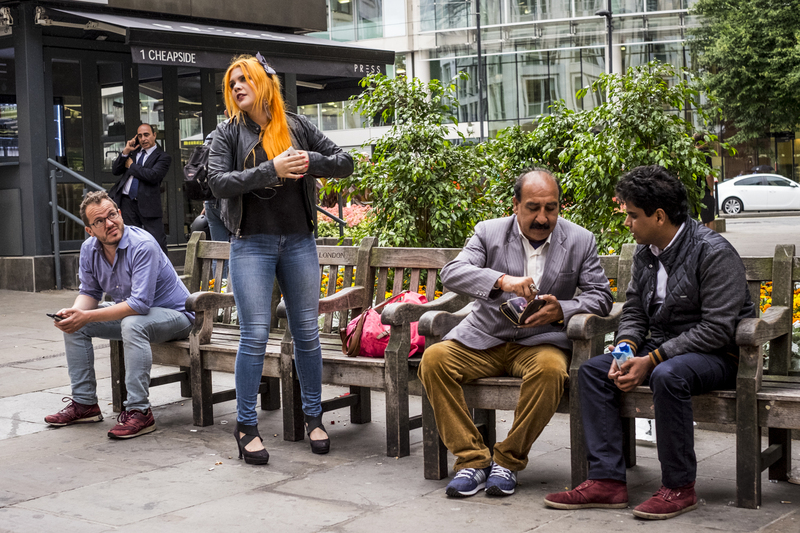 My Street photography workshops and courses are fun, informative and relaxed. They are both challenging and highly enjoyable and designed to stretch your imagination. I uses the Fuji X100F and XPro2 with a 35mm or 16mm Prime lens. You can bring any DSLR or mirrorless camera on this course; fixed lens compacts are also welcome. If you are wondering what lenses to bring 50mm is ideal for full frame and 35mm film uses. APSC size sensors 35mm is ideal or lenses around the normal focal length. The day normally starts at 10.30am with a coffee introductions and a discussion about the day. We will touch on the ethics and law and how to deal with challenges in this area. Next we will discuss camera set up for the day and the best set up for street photography with a practical demonstration of street camera technique. Matt will cover what Street Photography is, and show you some of his favourite Street Photographers images. He will also show you the best way to approach his style of Street photography. We normally spend around two hours covering these subjects then around 12.30am we head straight out on to the streets where you can watch the way Matt works and try out some of the tips and tricks that he shares with you. We break for lunch around 1.30pm where we can find a quiet place for a snack to discuss the mornings work and share our experiences. We then go back out on the streets to practice your new street techniques and try and find your street rhythm and look for some interesting characters or great light! We stay out shooting until about 4pm, we then find a quiet place to sit as a group to discuss the day and this will include lessons learnt. Matt will share his processing techniques and preferred software. Matt will give you his views on Critique and show you how to review your own work. I know the majority of you guys that read my blogs and attend my workshops are Fujifilm users but for all you that have other brands of camera please feel free to book on any of these workshops as all camera brands are more than welcome. These will be the last Street Photography Workshops in this format at this price. I have some interesting ideas for Locations and Styles of Workshops for next year, these workshops will be a little more complex so require a lot more planning. I will advertise the 2018 Workshops around about October time. I will be leading the Fujiholics Photowalks in London, Edinburgh and Bristol this year so make sure you sign up before all the places are gone. We have over 350 people signed up for London already. Hope to see some of you on a Free Walk or Workshop and if you are a Fujifilm shooter then our new Facebook group might be for you here. This entry was posted in Birmingham, Candid, Citys, Courses, Events, Fujifilm, fujiholics, Fujilm, Gear, Lens, London, photography, Photwalk, Street Photography, Uncategorized, walk, X-T1, X-T10, X-T2, X100F and tagged black and white, Calumet, Colour, Fujifilm, fujiholics, Matt Hart, Street Photography, Walks, Workshops. Here we go again, another year of Photo Walks. This year I will be leading four Fujiholics Photowalks. The Liverpool walk has already taken place but Bristol, Edinburgh and London are still up for grabs. I would like everyone to know that you can bring any make of camera with you and that includes smart phones. You can also come without a camera just for a day out. It’s all about like minded people getting together to have a great day out and to share ideas and meet new people. The walks are free to sign up to, I only ask that if you sign up then change your mind, please follow the link from your Eventbrite confirmation email to remove yourself so other people can sign up as numbers are limited. So far this year London is in the lead with 280 people signed up. We would like to see more families and children on the walks and would like you all to know that kids are welcome as long as they are accompanied by an adult. Why not bring them to London and make a weekend of it. They can use their phones or even buy them a throw away camera. Photowalks are great, I have met friends for life on the walks and also made some amazing business contacts. They are a great way to explore our cities on foot with a great bunch of people. A route and map is emailed out to everyone that signs up approx 1 week before the event to download to your smartphone or gps device or you can print out the map. You don’t have to keep up with the guys at the front as we tweet our location throughout the day and use a unique hashtag for the day. You can stop for refreshments along the way or even a cold beer and then catch up a bit later by taking a shortcut using the tube. In London this year we have the Fujiholics Team and a few other Pro Photographers as well as some retailers so hope to bring you a few offers for the day. There will be quite a few Fujifilm X Photographers and Ambassadors about as well. The Fujiholics Team really do make you all feel welcome. I would love to see as many of you guys on one of the walks this year, the last three walks are spread out all over the UK so feel free to come and join us. Here are the links to the walks.. If you want to buy cheap train tickets then here is a link to sign up to The Train Line ticket alert. This entry was posted in 23mm, 27mm, 90mmf/2, black and white, camera, Camera Bags, Candid, Citys, Colour, Events, Fujifilm, fujiholics, Gear, Landsape, London, Long Exposure, photography, Photwalk, Street Photography, Uncategorized, walk, X-T1, X-T10, X-T2, X100F and tagged beer, cake, cameras, CityScape, coffee, friends, Fujifilm, fujiholics, Landscape, London, networking, people, photography, Photwalk, Street, walk. I have been asked on many occasions to help someone pick an image as their best image. I still find this very frustrating to say the least however it’s worse when someone asks me to give my views on their image, they tend to get very defensive ! I do offer critique but I have never asked for it and I never will. My personal journey is just that, mine. I only ever give critique by email if asked and never in open social media. Apart from working with clients I always make my own decisions good or bad and stand by those choices because my images are mine. It’s great to be able to self critique and I know it takes quite a while to become comfortable with doing this but by working it out for yourself it’s very refreshing when it all starts to make sense. It will take a lot longer to make sense if you always ask other people, it’s like starting a new job after a while you just get on with it and learn as you go, if you are still asking questions a year later there must be a problem! I shot landscapes for a long time before I realised that my horizons were not straight! From about 10 to 14 years old I had some horrendous landscapes but every one told me I was a great photographer ! The day I worked it out for myself I started to look deeper into my own work and study some of the past Masters, not to copy them but to learn about composition and try to work out what else I was doing wrong. I see it still to this day on facebook, someone will post an image with an horizon that is obviously not straight and 45 people click like and say WOW! Whilst photography is your own personal journey, those comments are not helpful. People go out and shoot 400 images on a day out, then go home and post 375 on Facebook or flickr because they can’t decide what images are the best or because they like them all. The best way to decide what are the best image from your day out is to make a book of your day out with 20 images you soon will start to see how unimportant 15 shots of the same tree are or 30 shots of your dog. So what is this blog post about ? Well it’s going to be very subjective, my choice, my journey. Lots of people will disagree with me and that’s great, it would be a boring world if everyone agreed. I will not be getting into a debate with anyone once this is posted I just don’t have the time and life is too short but I will give you a quick look into how I think, when out on the street and how I choose an image from a sequence. I delete all images I don’t use so I had to go out and shoot these images so I could show you how I work. The images in this sequence were shot on a Fujifilm X-T10 with 35mm f/1.4 and shot at RAW files, I shoot single shot and not continuous. 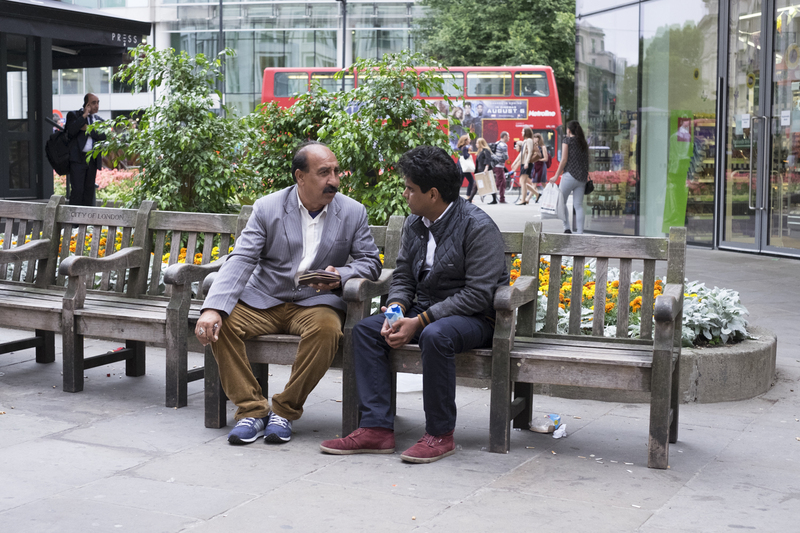 I was shooting in London and found these two guys on a bench and quite liked the interaction and started to work the scene, for me these two were interesting but I needed more, the guy on the phone was added interest. So I stepped back and started to wait but did not take my eye off the two guys or the benches. I did notice the yellow flowers and the empty benches. As a girl walked past from the right I noticed a girl coming into the frame from the left with orange hair that went quite well with the flowers. As the girl came into the frame a guy who was not with her sat down on the bench and admired the girl as she started to put her jacket on. I liked the shapes she was making with the jacket. The scene was now starting to build and lots of elements were coming into place for me with my new interest in colour. I was so pleased she had walked into the frame adding more of a story and more subjects to make a much more interesting scene. I liked the guy under the Cheapside sign but the guy with the bike helmet came into the frame and the woman in the white jacket far left was distracting me, so I made one more exposure by moving the camera to the right and waiting for the guy to be behind the girl, a personal choice based on the fact he was distracting from the guy looking at the girl. At this point I was sure that this frame frame was the one I wanted to use but would leave them all on my memory card until I got home to make my final choice. It’s bad practice to delete from your card as this creates gaps in the data and when the card fills up this can cause card corruption, as well as accidental deletions. I had waited for the scene to build and let the subjects all take up their positions in the shot, all the time I was standing only feet away just watching the expressions. The girl picked up her bag and walked off after this shot and the guy at the end looked down at his phone. I could have stood here for hours just shooting these benches and the people that came and went all day. My normal method of selecting and editing my work is harsh and involves the deletion of all the images I don’t use. Its worked for me all my life and I am happy with it. The main reason I do this is to force me to go out and shoot and look for new images every day. I can’t sit indoors in the winter and look through my hard drive for images that could have been, I have to go out and look for that image that amazing image that is out there somewhere. So when I got home from my trip to London I quickly chose the main image in this set and the only reason the others are still around is this blog post. The only edited image is the main image and last image the rest are RAW files. I am not a prolific shooter but I do work a scene just like this when I find some interesting subjects. I was in London for three days and shot about 100 images a day and in my London file now sits 35 images, but 10 have been kept for using like this on my workshops. So I have have 25 keepers but out of the 25 keepers I only have 4 I like and nothing I would call great or amazing, that one is still out there. This is just a little insight into how I work and to help you guys that email me and message me on facebook about how I work that don’t get a chance to come on my workshops. I do manage to get some quite good single shots but most of the images I have I like have been part of a sequence where I have allowed the scene to build whilst shooting and observing. I used to wait weeks to develop my film and still do but once developed I follow the same route, if I ever get stuck in a sequence I will print my images out and put them on my wall until one jumps out at me, but most of the time when I do that I just delete the lot ! This entry was posted in Colour, London, Street, Street Photography and tagged Building, Choice, Colour, Fuji, Fujifilm, Image Selection, Scene, Street.